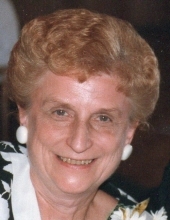 Esther Wolak nee Maciejewski, 91, beloved wife of the late Edward; loving sister of Lorraine (late Sylvester) Ptak and late Harry (late Marianne) Maciejewski; dear aunt of many nieces and nephews. Visitation Friday, December 7th. from 9:00 A.M. until 10:45 A.M. at St. John of the Cross Catholic Church 5005 S. Wolf Rd. Western Springs, IL. Funeral mass at 11:00 A.M. Entombment Resurrection Mausoleum. In lieu of flowers, masses preferred. For additional information, contact Suburban Family Funeral Home at 708-652-1116. To send flowers or a remembrance gift to the family of Esther Wolak, please visit our Tribute Store. "Email Address" would like to share the life celebration of Esther Wolak. Click on the "link" to go to share a favorite memory or leave a condolence message for the family.